The following is a guest post by Dr. Chong Kwek Yan, on a recent series of papers in Nature in Singapore that arose from the work of a student that he supervised. Kwek Yan received the NUS Overseas Postdoctoral Fellowship in 2015 and has since been based at the Centre for Excellence for Environmental Decisions, The University of Queensland. This October, he will be returning to the Department of Biological Sciences at NUS. Three years ago, early in 2014, Associate Professor Hugh Tan whom I was working for told me an earnest student keen on botany had approached him for a UROPS project, and asked me if I had any ideas. Back then, the plan to establish Singapore’s first marine park around some of the southern islands had just been announced, so I casually suggested that she could map out the natural vegetation on those islands and compile checklists of the islands’ flora, in the same spirit as Teo et al.’s (2011) checklist and map for Pulau Semakau. Symplocos adenophylla, listed as Endangered in the Singapore Red Data Book, found on Big Sister’s Island. The marine park constitutes the sea around Pulau Subar Darat and Pulau Subar Laut, affectionately called Small Sister’s Island and Big Sister’s Island respectively, as well as the seas off the southwestern coasts of St. John’s Island (also known as Pulau Sakijang Bendera) and Pulau Tekukor. We knew that efforts must have been ongoing to document the marine biodiversity of the islands’ waters and coasts for them to be proposed as part of a marine park, but I thought it might also be useful for the park managers as well as botanically inclined park visitors to know what plants could be found on land. Prof took me seriously and got in contact with Dr. Karenne Tun of the National Biodiversity Centre, whose team was setting up the marine park, and Dr. Tan Koh Siang of the Tropical Marine Science Institute which had a research facility on St. John’s Island. I roped in Alex Yee, who was then a PhD student, to help coach Sherry with making maps. The rest is (natural) history. There were working checklists of the flora of these islands from Prof’s earlier expeditions in the 90’s which led to a publication by Koh et al. (2002) in Journal of Biogeography 29: 93–108. These were supplemented by records of collections from each island deposited at the Singapore’s two herbaria. Last and most fun of all, we gathered the young botanists working in Prof’s lab to make several picnic trips to cross-check these lists and map the vegetation and the locations of rare plants on the islands. Trying to look (and stay) cool in the shade along the coast of Small Sister’s Island. 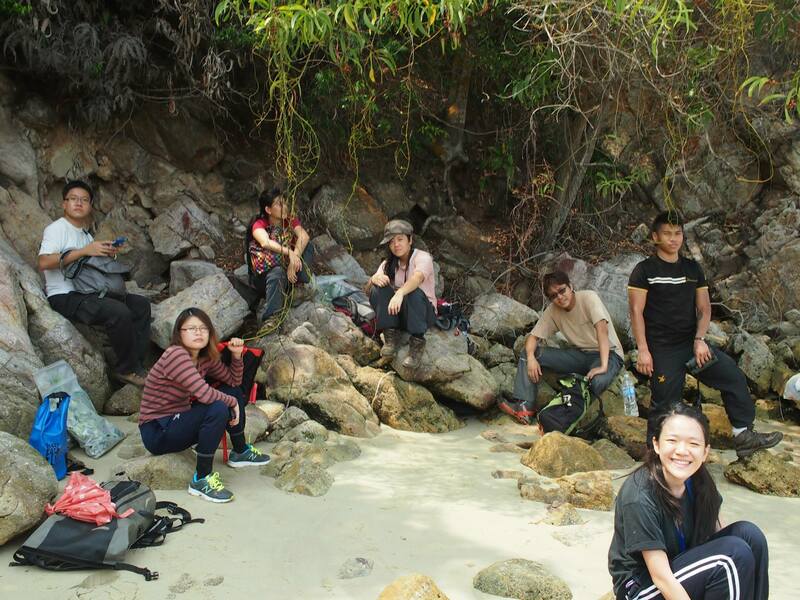 From left to right: co-authors Reuben, Wei Wei, Jolyn, Louise, Kwek Yan, Sherry; and Jake Gonzales who was an intern with the Botany Lab. Photograph by Alex Yee. Sherry got a good grade for her UROPS (I can’t remember exactly what grade but it was a good grade [gosh, that sounds like what a well-known, recently elected official from a certain country would say about his own grades back in school]) and worked hard to turn her report into a series of manuscripts for Nature in Singapore titled “The vascular plant flora and vegetation of the islands associated with Singapore’s first Marine Park”. Found on St. John’s Island, Viscum articulatum is a hyperparasitic mistletoe, i.e., a mistletoe that grows on another mistletoe, which in this case is Dendrophthoe pentandra. Photograph by Chong Kwek Yan. Kwek Yan passionately explaining what a hyperparasitic mistletoe is to Sherry, who looks on with an inscrutable expression. Photograph by Alex Yee. There’s not much left to say except to encourage everyone to check these papers out. They contain many nice maps and pictures. Yes, literally. This LKCNHM book, A Field Guide to the Geology of Singapore by Oliver and Gupta published earlier this year aims to introduce readers to the geology of Singapore by means of field visits to relevant sites of interest. It gives an overview of the plate tectonic evolution of Singapore, its geology, and a travel guide book-like excursion compendium to interesting locations such as Pulau Sajahat, Western Catchment, Sembawang Hot Spring, and even Orchard Road! If you have ever wondered how Singapore looked like in the Late Triassic Period (200 Ma), then do not miss the artist’s impression of the view from the vicinity of Sentosa looking north towards Bukit Timah complete with dinosaurs (pg. 10). Oliver GJH & Gupta A (2017) A Field Guide to the Geology of Singapore. Lee Kong Chian Natural History Museum, National University of Singapore, Singapore, 71 pp. Uploaded 4 January 2017.